The experiment was conducted to study the effect of four levels of phosphorus (0, 20, 30 and 40 kg P2O5 ha-1) and four biofertilizer treatments [uninoculated control, Rhizobium, plant growth promoting rhizobacteria (PGPR) and Rhizobium + PGPR] on growth and grain yield of lentil. The experiment was conducted in factorial randomized complete block design (RCBD) with three replications. The periodic data recorded at 30, 60, 90, 120 days after sowing (DAS) and at harvest showed that the highest growth in various parameters i.e. plant height, branches plant-1) and shoot dry matter accumulation was recorded with application of 40 kg P2O5 ha-1), however, it was at par with 30 P2O5 ha-1). Among the biofertilizers, Rhizobium + PGPR treatment gave maximum values of growth parameters like plant height, branches plant ha-1) and shoot dry matter accumulation at all the stages. At 30-60 DAS, the maximum crop growth rate (CGR) was recorded with the application of 40 kg P2O5ha-1) (71.3 kg ha-1 day-1) and co-inoculation of Rhizobium and PGPR (72.0 kg ha-1 day-1). Application of 40 P2O5 ha-1) and use of coinoculation (Rhizobium + PGPR) provided the highest grain yields. 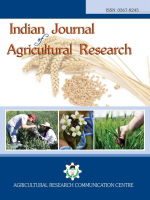 The study highlights the importance of phosphorus application and biofertilizers inoculation for improving the growth and grain yield of lentil. Biofertilizers, Crop Growth Rate, Dry Matter Accumulation, Grain Yield.